Season extension refers to any practice that allows a crop to be cultivated or harvested outside its normal production season. Growers may be able to capture a greater market share by being able to provide product to distributors and retail outlets when their competitors cannot. Farmers can extend the production and harvest season for crops through techniques that are based on thermal principles. The two primary goals are to protect crops from frost or heat damage, and speed the growth of crops for quicker maturity and higher quality. Season extension techniques vary greatly in their level of complexity. They can be as simple as selecting an early maturing, cold hardy, or heat-tolerant variety; planting a wind break; or irrigating crops to reduce crop damage from heat or cold. They can be as complex as year-round production in a heated greenhouse. Farmers through the centuries have learned to use available materials to produce earlier crops in the spring, grow cool-season crops in summer, maintain production well into the fall, and even harvest crops through the winter. Time-honored methods include cold frames heated with manure, shade structures, wind breaks, irrigation, masonry walls or stone mulch as heat sinks, and cloches (glass bell jars) to protect individual plants. The use of plastic in horticultural crop production has increased dramatically in the past decade, greatly extending the possibilities for year-round production. 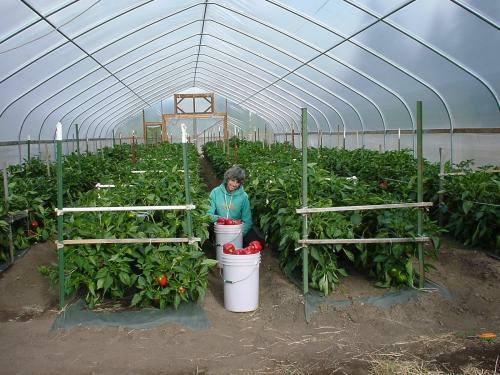 Variously colored plastic film mulches, row covers, shade cloths, low tunnels, and high tunnels/hoophouses help to protect crops from the weather. High tunnels are springing up around the country as market gardeners increasingly view them as essential to their operations. Selection of varieties that mature over a range of dates allows a farmer to harvest a crop over an extended period. Heat tolerant varieties can be grown during warm months, and cold tolerant varieties during cold months, to stretch out the proportion of the year in which a crop can be marketed. 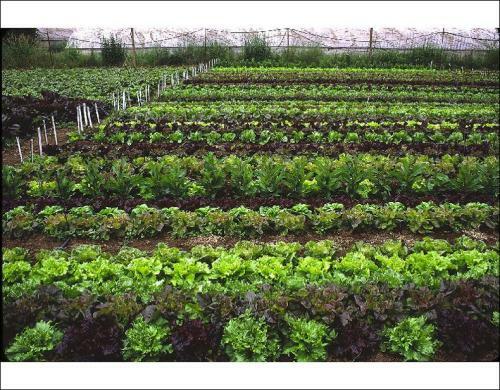 Salad greens and cole crops can be successfully grown most of the year in many regions of the US if appropriate varieties are selected, particularly if combined with other season extension strategies such as shade cloth and high tunnels. Conducting on-farm variety trials is a good way to identify varieties that perform well in a particular region and when grown under a farm's unique suite of practices. Lettuce variety trial at Wild Garden Seed, Philomath, Oregon. Photo credit: Karen and Frank Morton, Wild Garden Seed. Raised beds are planting beds in which the soil has been loosened and piled up to a level above that of the surrounding soil surface. Raised beds heat up more quickly in spring, allowing earlier planting. Mulches are any material placed on the soil around plants. Plastic mulches are typically plastic sheeting with slits through which plants grow. These are used extensively in large-scale vegetable production to suppress weed growth, retain soil moisture, increase soil temperatures, and speed crop growth. Plastic mulches are permitted for use in organic production systems as long as the plastic is removed from the field at the end of the season. Organic mulches are typically applied to retain soil moisture, increase soil organic matter content, and cool soils. Row covers are light, porous, permeable fabrics placed over plants in order to retain heat. They can offer up to several degrees of frost protection, as well as protection from wind and insect pests. Cold frames are transparent-roofed enclosures, built low to the ground, used to protect plants from cold weather. Cold frames are more typically found in home gardens and on smaller vegetable farms. They are most often used for growing seedlings that are later transplanted into the field. High tunnels are metal frames covered in plastic sheeting. They function similarly to greenhouses, but are generally unheated and in most cases do not have exhaust fans. Many high tunnels are constructed so they can be moved from one location to another, to permit crop rotation and soil management. The fully heated and artificially lit greenhouse is the ultimate season extension device, as it allows crops to be grown year-round, even through sub-zero winters. The adoption of this energy-intensive form of season extension by organic farmers has been debated in the organic and sustainable agriculture communities. Irrigation is applied to crops to prevent damage due to high or low temperatures. Wind machines move air to prevent accumulation of cold air near the ground, protecting blossoms and crops from cold damage. Bachmann, J. 2005. Season extension techniques for market gardeners [Online]. National Sustainable Agriculture Information Service (ATTRA). Available at: http://attra.ncat.org/attra-pub/seasonext.html (verified 4 March 2010). Roos, D. and D. Jones. 2005. Season extension [Online]. North Carolina Cooperative Extension. Available at: http://www.ces.ncsu.edu/chatham/ag/SustAg/SeasonExtensionOctober2005a.pdf (verified 4 March 2010).